Multi-codes represent the group of services that you commonly render at the same time. 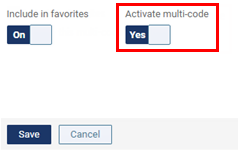 For any location, you can inactivate multi-codes (except those that are required by Dentrix Ascend) that you do not want to use so that they do not appear wherever procedure codes can be selected. If you are not already viewing the location that has a multi-code that you want to inactivate, select that location from the Location menu. On the Procedure Codes tab of a location's Procedure Codes & Conditions page, select a multi-code. To quickly locate a multi-code, type a code or description in the Search for specific procedure box near the top of the page. Set the Activate multi-code switch to No. Note: When you inactivate a multi-code, the other options for it become unavailable.